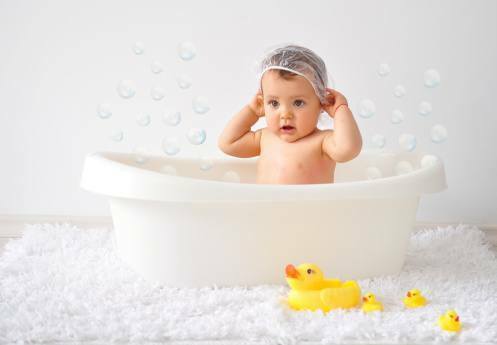 It is formulated for babies, but what is actually in baby wash? While most brands tend to list what’s not in their products, it can be tricky to find what is actually in them. Not all brands list ingredients on their website, so unless you physically go down to the supermarket to check ingredients lists, you might not know what is in your favourite brand. Out of our top rating brands, only QV, Curash and Johnson’s list the ingredients on site. Here are the generic ingredients for baby wash, but check the packaging for any specific ingredients. Like most other soaps, baby wash is mostly water. On any ingredients label, the items are listed in order from highest to lowest quantity that is in that product. For the most part, water is what dilutes the chemicals that make up the rest of the soap or baby wash.
Also listed as Glycerol or Glucose, it is a simple sugar compound that is colourless, odourless, and is used in thousands of different pharmaceutical products. It is used in baby wash and other soaps because it is soluble in water, and is hydroscopic, which means it can hold water molecules from the surrounding environment. Essentially, the Glycerin/Glycerol is what makes bubbles. Different brands of wash will use different kinds of Sodium. Out of the three brands that list their ingredients online for consumers, Sodium Lauryl Sarcosinate, Sodium Laureth Sulfate, Sodium Chloride, Sodium Hydroxide, Sodium Benzoate, Sodium Cocoyl Isethionate, and Sodium Trideceth Sulfate were found. These sodium compounds are all different types of detergents, which is why they are in baby wash – to clean the baby (or adult, as more than half of the parents we surveyed use baby wash for themselves). Any ingredient with the word sorbate in it is a preservative. Sorbic acid, as it is generally referred to, is a natural organic compound that is colourless and soluble in water. It is used as a preservative in food, cosmetics, and pharmaceutical products because it is quite diverse. The deviations of Sorbic acid such as sodium sorbate, potassium sorbate, and calcium sorbate are all antimicrobial agents, meaning that they prevent the growth of mould, yeast, and fungi. The pH of these chemicals is adjusted based on what it is being used in. These variation are what you will find on the label of your baby wash.